This semester I have been a Collections Intern with the Miami University Art Museum’s (MUAM) Collections Manager/Registrar Laura Stewart. I have been involved with the museum since my first year at Miami, through the museum’s Art Museum Student Organization, which has given me the opportunity to help plan and promote student events. This semester, I have had a much more in-depth look at the operations of the museum and I have been able to work very closely with objects in the museum’s permanent collection. It has been very interesting to gain a better understanding of the depth of our museum’s collection (approximately 17,000 items!) and to learn about how to care for the collection through storage documentation. One of the most interesting processes I’ve been able to learn about through this internship is the process of the museum’s accessioning of objects into the collection. There is a lot more paperwork and consideration that goes into this process than I first imagined. One of my tasks was organizing object files for each acquisition from 2015. These files include information about how the museum came to own the object, whether as a gift from a donor or a purchase by the museum. 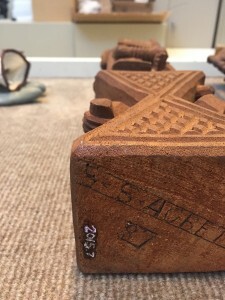 Object files also include general information about the object itself (including measurements, condition, and provenance), about the donor, about exhibitions it has been in, and about the artist or maker. All of this information is also added into the museum’s database. The object files and database entries are useful to the rest of the museum staff and to individuals doing research about the objects. I did not realize how essential these documents are to the museum’s operation, but they are a necessary resource for designing exhibitions, teaching about the objects in the museum, and further collecting activity by the institution. Once a gift or purchase is to be accessioned by the museum, it is assigned a permanent number known as the accession number. For most objects, the number is recorded on the object itself, but following collections guidelines, this number must always be removable in order to avoid permanent damage to the object. 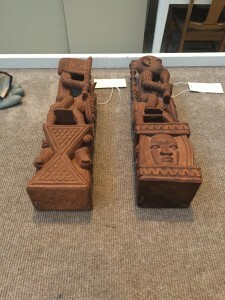 In the case of the two Nigerian wooden sculptures pictured below, a base of Acryloid B-72 in Acetone was applied before the number was recorded on the object. It was very nerve-wracking to be making a mark on an object, but I felt better knowing that it was removable. Objects are often marked in more than one place with their accession number, so these sculptures also received a tag with their accession number and some additional information. (left) “Yoruban Equestrian Figure with Flag” and (right) “Yoruban Equestrian Figure with Pipe and Braid” both 1987, Simeon Agbetuyi (Nigerian). Carved wood, Gift of dele jegede. detail of “Yoruban Equestrian Figure with Flag” 1987, Simeon Agbetuyi (Nigerian). Carved wood, Gift of dele jegede. These sculptures will be on display in Fall 2016 as part of the exhibition named Collections Highlights: Recent Acquisitions that I have been able to help curate along with Katrina Fausnaugh, another intern, and Jason Shaiman, the Curator of Exhibitions. 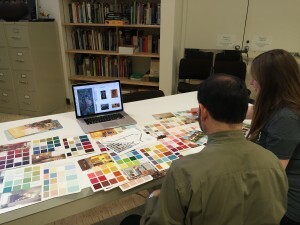 You can see Katrina and Jason below, when we were choosing the paint colors for the exhibition. Join us in the fall to see these objects and many more exciting recent acquisitions! 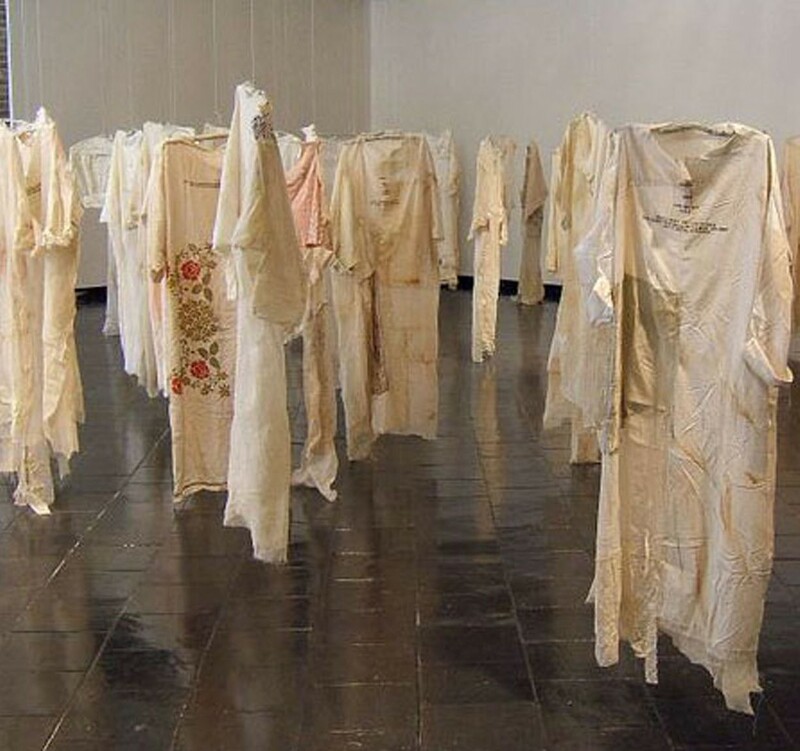 I have learned a lot as a Collections Intern and I am so glad that the Miami University Art Museum is a teaching museum that allows their students to have a wide variety of experiences. This has been the perfect opportunity for me as an Art & Architecture History major to gain some experience in a museum setting and think about my career interests and options while working closely with museum staff and the museum’s collection of objects. Although MUAM is an art museum, there are opportunities for students of all majors and interests to become involved. Other internships include Curatorial, Educational, Interactive Media Studies, and Marketing/Communications. Applications for fall 2016 internships are due Sunday April 17. For more information about these internships, visit http://miamioh.edu/cca/art-museum/current-students/internship-work/index.html. 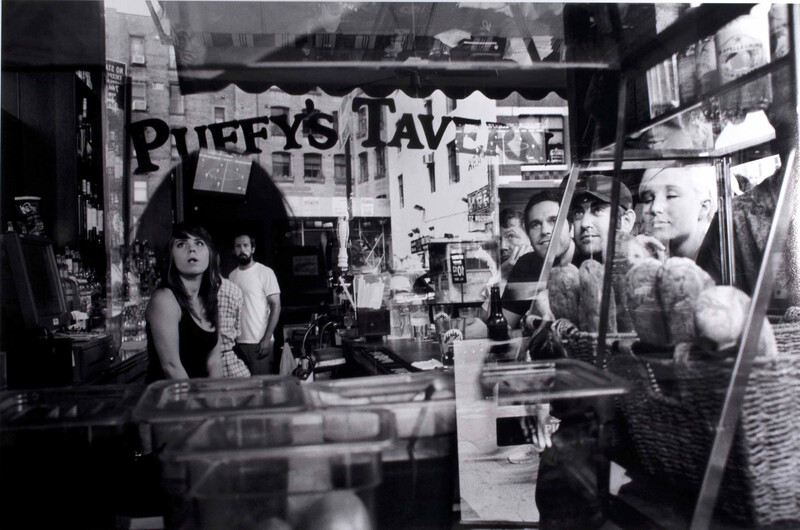 Announcing the Fall Exhibition Lineup!